You can see it is an open design, with the exception of the two walled-in rooms. The second room is a utility/storage room that would contain the washer/dryer, safe, electrical panel, water heater, chest freezer, and storage space. 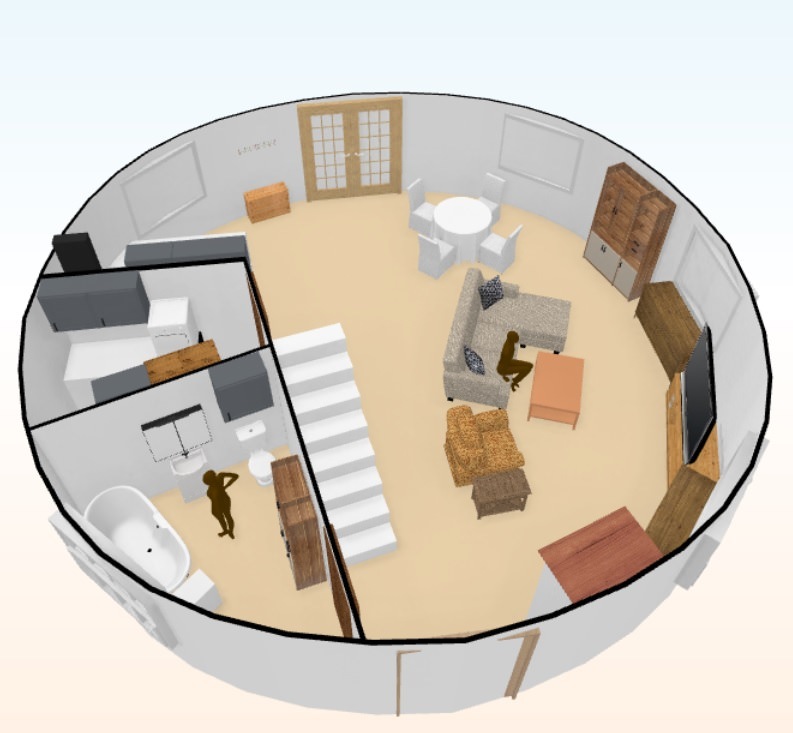 The idea would be to run plumbing and electricity from the utility/storage room, through the walls on either side to the bathroom on one side (sink, toilet, and bathtub) and the kitchen on the other side (fridge, dishwasher, and sink). Electricity for the loft would be run through the ceiling, and electricity for the rest of the yurt (near the TV, etc. ), would be run along the perimeter. The venting could be done through the ceiling of the framed-in rooms, but I’m not sure where those would vent out to. I guess it would have to be done through the wall (similar to the manufacturer’s stove flashing solution) or through a convenience panel? Obviously not through the fabric roof. On that note, I’m not sure yet where the mini-split unit would come in through. Above the rooms would be a loft, which would hold a queen bed and computer desk. There would be a landing above the utility/storage room door. All of this work would be completed by licensed professionals. I’m realistically looking at an outlay of probably $80 - 100k (which does not include furniture, the land, or any related improvements). I would probably be building this yurt in the Blue Ridge Mountains of Virginia. In the above budget estimate, I am including $4k for permitting/inspecting/etc. Anyway, thought I’d share this idea and plan with the yurt community, as I thought this crowd would understand and might appreciate it. Welcome any thoughts or suggestions. I like it, though I don't know if I would have the second room. The walls take up precious space. I understand it for the bathroom, but the other room? Not so much. Remember, you have 710 sq. ft to play with, not a lot and it fills up faster than you might think. I like your approach for the rest of the room where you take advantage of the wall space! Also, I can't tell from your diagram, but you may want to consider a second door. Most municipal codes require that anyway..
Yeah I was going to say I like it too. Much better than some of the eccentric plans some people have posted on this site over the years. Thanks, Jafo. The other room is a utility room which would hold the water heater (possibly a Toyo on-demand oil water heater), chest freezer, washer/dryer, fuse box, etc. Floorplanner lets you design to scale (you can even change the dimensions of items/structures/furniture/appliances to match specific models you have in mind). You can also virtually "walk through" your design, which lets you see how it might feel/look walking around in your space, how much space you have to work with, etc. Based on my modeling, I though the utility room made sense to house some of the stuff that might be awkward to place anywhere else in the yurt, such as the Toyo water heater or the washer/dryer stack. The alternative would be to put that stuff outside, in an adjacent shed, for example, right? There are two doors. In the top picture, the French door is at 12 o'clock, and the fiberglass door is at 6 o'clock. The green lines are the beams and the red dots are the helical piles. The black rectangles are the SIPS panels (the size of the panels in the middle is 4’x10’, I think). This design should be very simple and yet extremely strong, with a high R value. As an added bonus, this platform/foundation is also theoretically movable/portable: the SIPS can be taken apart and loaded onto a truck to move, and the helical piles can simply be unscrewed from the ground, loaded up, and moved, as well. So the benefits of this design are many fold. The downside, of course, is that it is somewhat expensive. I tried to integrate some efficient design concepts in the interior, as well. All plumbing runs from the utility room out through the stick frame walls -- a very short run. There is no plumbing running clear to the other side of the yurt, nor is there any need to run plumbing through/under the SIPS to reach far corners of the yurt, etc. 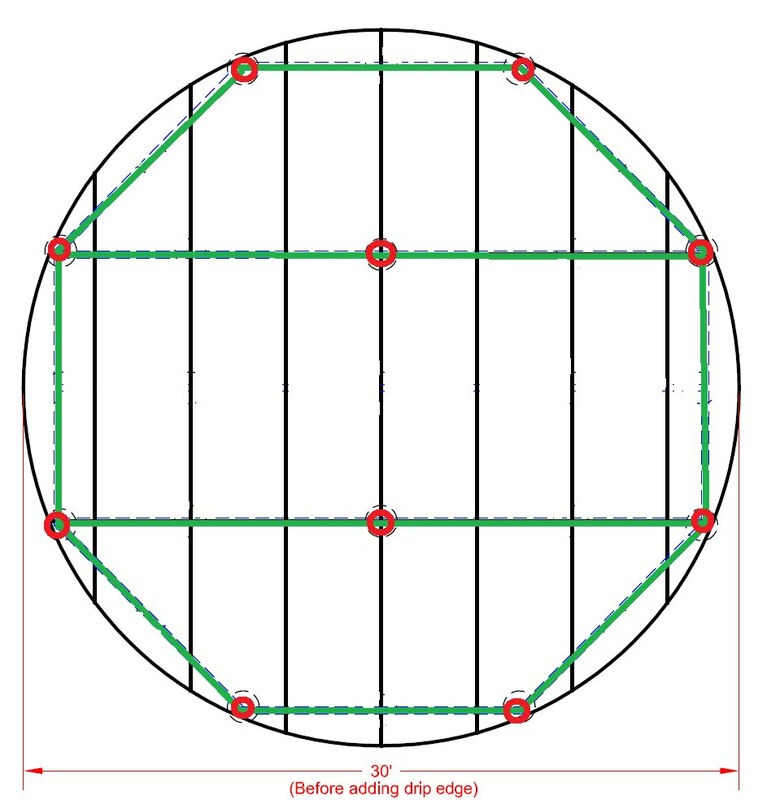 This design simplifies construction and lowers cost/time of building. As you said, there are some eccentric designs out there by people who have even less understanding of construction than I do (plumbed toilets that back against the lattice wall, etc.). I am the opposite of the “design-build” school that Juicymaters talks about in his blog. I like having a well thought-out plan that incorporates best practices and efficient design principals, wherever possible. That said, my current design is far from perfect and can be tweaked to make it better. In fact, I just caught something: the stove/range should probably not be that close to the lattice wall. 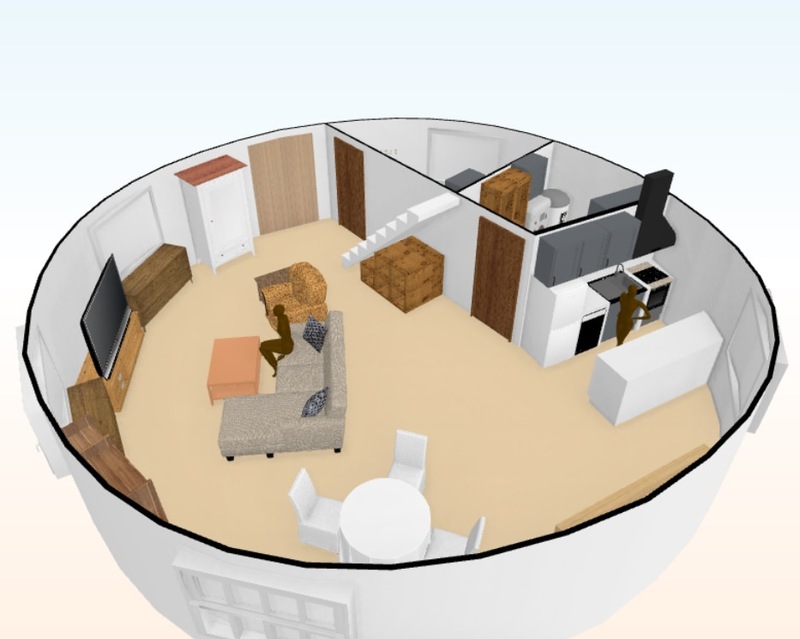 I'm also having some trouble envisioning the loft space above the framed-in rooms. The alternative would be to put that stuff outside, in an adjacent shed, for example, right? You could, or you could make the bathroom just a little bigger to house it all? I would also suggest venting through the wall. You do not want to mess with the roof if you do not have to. It will shorten the lifespan of it. inside when you say, take a bath/shower or cook. A dehumidifier will probably be necessary. Your plan looks very nice. Venting for the bathroom and cooking exhaust could be mounted into your partition walls, and using a 'downdraft' exhaust fan, could actually vent through the platform and then outside. Plumbing vents can go through the yurt wall using a boot flashing (available at your local hardware store) in a similar fashion to the stove flashing. Just make sure the top of the flashing slips under your top cover valance. A good place to mount the air handling unit for your ductless heat pump would be on the edge of the landing at the top of the stairs. This would face it into the main living space and it should be out of the way. The electric and refrigerant lines could come up through your platform and into your partition wall so they are out of site. Good luck with your project, it sounds like it will turn out nice. Hey Bulldog and TSRalex like this. Many thanks for the kind words, absolutely feel free to use the design. Yes, I am having difficulty envisioning how the space on top of the loft will be used, but it looks like there is sufficient room for a queen bed and a desk/chair setup. It's hard to tell in the images I posted, but there is a stacked washer/dryer unit in the utility room. in mind for when I start this project -- possibly two years away (I might be retiring then... but then again, I might not; it's a very difficult decision I'm still working through). ... You will be releasing a lot of moisture inside when you say, take a bath/shower or cook. A dehumidifier will probably be necessary. That tracks with everything I've been reading. I'm trying to incorporate other peoples' experiences into my build. Moisture seems to be a major concern, which -- if left unchecked in a yurt -- can lead to mold issues. My design has a bathroom fan, on which I do not plan to skimp, and which I will use religiously. I recently watched an episode of This Old House where they retrofitted a bathroom fan in an existing structure, and they installed a timer switch that could run the fan for 10 minutes, 30 minutes or 60 minutes. I plan to incorporate such a switch and use it each time I take a shower. Along the same vein, my design has a range hood over the range that I will use every time I cook. I like the boot flashing idea from the Pacific Yurts representative above, and I will likely mount the bathroom fan and range hood exhausts through the walls, via EPDM boot flashing assemblies, with the top of the flashing slipped under the top cover valance to inhibit leaks, as the Pacific Yurts representative explains above.